Hey! You're doing that all backward! But then, when doing Reverse-Lens Macro photography, that's exactly how you want to go about it. So let's put those old film camera lenses back to work and explore an ultra-close-up world. First, let's define “macro.” A true macro photo is defined as one where the image recorded on the camera sensor is at least the same size as the size of the actual subject. This is known as a 1:1 magnification ratio. 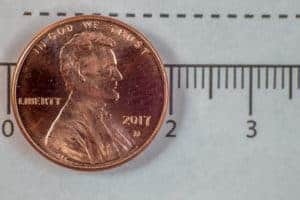 A practical example: A U.S. penny is 0.75 inches (19.05 mm) in diameter. A digital camera sensor, (on a full frame camera), measures 24×36 mm. So shot with a macro lens on a full-frame sensor camera, the image below represents a 1:1. On a crop-sensor (APS-C) sensor camera where the sensor measures 14.9 x 22.2 mm (Canon), a shot of a penny at 1:1 would go outside the frame at top and bottom. Full-frame, uncropped 1:1 macro capture with reversed Vivitar 28-105mm. Note the width is just over 36mm. If your lens can't focus this close it isn't a true macro. So do we care about the magnification ratio? Probably not except to say that by strict definition, close-up photography isn't necessary macro photography unless it equals or exceeds a 1:1 magnification ratio. Many lenses will be labeled as having “macro capability), but unless they can achieve a 1:1 magnification ratio they are in reality “close-up”, but not true macro lenses. 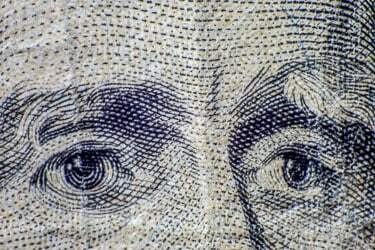 Also, cropping an image in editing to make it look ultra-close isn't macro photography at all. Buy a true macro lens – The easiest but the most expensive. Use extension tubes or a bellows which increase the distance between the lens and the sensor. Use magnifying lenses (diopters) in front of an existing lens. Mount a lens backward on the camera. This is the “Reverse-Lens Technique” and the one we'll discuss here. First a little caution. You will be taking the lens off your DSLR and when you do, you expose the interior of the camera and the sensor to dust. Thus it is best to work in an environment with minimal dust. If you will not immediately be placing another (reversed) lens onto the camera, cap it with a body cap until you are ready. Also, whatever lens you will have reversed on the camera will have it's back end and associated controls / connections exposed so the same cautions apply, put a rear cap on it when you are not working. Just practice the same cautions with regards to dust you normally do with cameras and lenses and you will be fine. The reverse lens macro technique will work with any lens and so the one you have on your DSLR most of the time will work. In fact, if you simply want to see what this looks like, remove the lens from your camera, hold it backward, tight to the front of the camera body, turn on the camera and move close to a subject. Move closer or further from the subject to obtain focus. Don't focus with the focus ring, (and of course autofocus will not work with the lens disconnected from the camera), but simply change the distance between the camera and subject to obtain focus. You get the idea and some instructional videos will show this method for when you are out in the field and want to make an impromptu macro with only a standard lens. Aside from trying to handhold a loose lens with one hand and your camera with the other, there are other reasons this is not the optimal method. 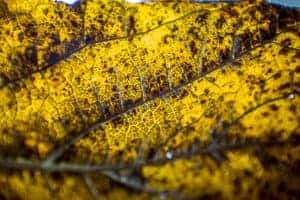 First, you probably already realized that with the lens disconnected from the camera you have no autofocus nor aperture control. In fact your camera will likely show a blank where the f/stop reading would be. Controlling the aperture at all seems rather problematic. Taping open the aperture lever on the lens is kind of a kludge. There must be a better way! The other great advantage of old film camera lenses is most have an aperture ring on the barrel of the lens. This will give you manual control of aperture, especially nice since you won't be able to control aperture from the camera. So how are you going to mount these lenses to your camera? Backwards of course! On the front of these lenses are the filter threads. 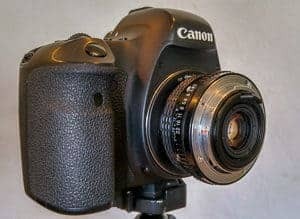 Often the filter size (in millimeters) will be displayed somewhere on the lens and, if you have a lens cap, often it will be found on the inside of the cap. 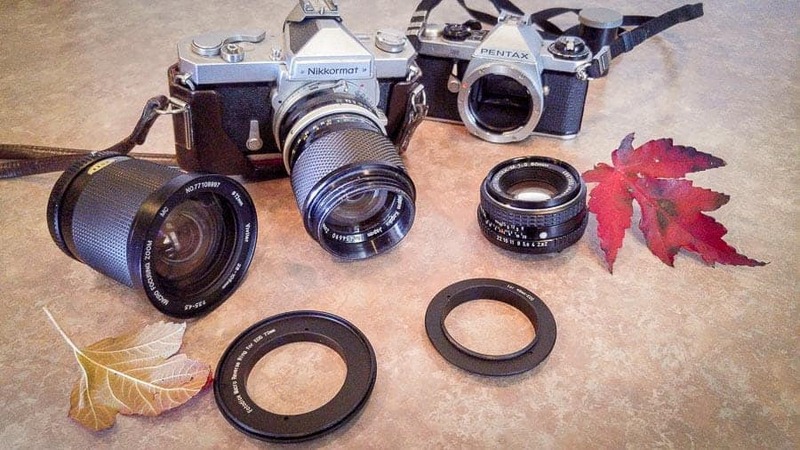 The lenses from my last film camera, (a Pentax ME Super), were a Pentax 50mm f/2 with a 49mm filter ring and a Vivitar 28-105mm f/3.5 with a 72mm filter ring. I wanted to use these on my Canon EOS 6D. So what I needed were Macro Reversing Rings, one with 49mm threads, the other with 72mm threads, and both with a Canon EOS mount on the other side. Screwing the threaded side of the rings onto my lenses so the EOS mount was exposed made it possible to mount these on my camera. Had I other lenses with different filter thread sizes, I would get reversal rings for those filter sizes or step-up/step-down rings to adapt my reversal rings to the filter size(s) of other lenses. You'll note that of the two lenses I used, one was a “prime” lens, the 50mm Pentax. The other was a zoom, the 28-105mm Vivitar. Functionally, what difference does this make? With the prime lens, the focal length was fixed and the size of the object in my frame pretty much stayed the same. Focusing on a subject was done more with changing the distance between the camera and subject, the focus ring had minimal impact. With the zoom, I could change the size of the object in my frame by zooming and also adjust the focus with the zoom. Additionally, I could also focus by changing the camera to subject distance. One factor which also takes a little more “backward thinking” was that the longer the focal length, the further I had to be from my subject to obtain focus. The shorter the focal length, the closer I could get to the subject. I'd guess that with the Vivitar 28-105mm zoom that around 70mm was giving me about a 1:1 magnification ratio with the 105mm end more in the “closeup” range and the 28mm end a little over a 2:1 magnification. As is the case with prime vs zoom when mounted in standard fashion, even when mounted backward a prime lens will generally deliver a sharper image while a zoom offers more versatility in framing the subject. Shot w/ reversed Vivitar 28-105mm at 28mm. 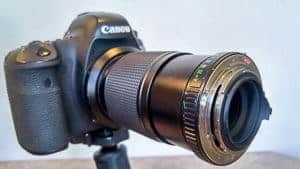 So let's outline a step-by-step approach to making reverse-lens macros. Determine which lens(es) you'll be using and have the proper macro reversal rings. Mount these to the front of your lens(es). Have a tripod or means to mount your camera so it won't move during a shot. The magnification factor of macro work greatly amplifies camera movement so keeping things rock-steady is important. Shooting outside where it may be windy and your subject may move even slightly will be highly challenging. Select your subject. Know that your depth of field will be sliver-thin, sometimes with one part of the object in focus while another part only a few millimeters away not in focus. 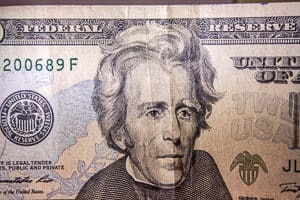 You may want to use a subject with minimal depth and/or shoot it in such a way that as much of the object as possible is in the same “focal plane.” Coins, stamps, paper bills, or other flat objects make for good beginner subjects. Light your subject. Often because you will be extremely close to your subject, getting light onto it may be a challenge. You may also find that to try and maximize depth-of-field you will be shooting with a small aperture and need more light. Lighting for macro photography is a whole subject unto itself. Be ready to get creative here. Mount your lens – Remember, it'll be backward on the camera, attached by the reversal ring. Use Manual Mode on your camera. You will have control of the ISO and Shutter Speed on the camera, but not Aperture. Remember, you'll be doing that on the lens itself. Note the very limited depth of field, even at f/22. Open the Aperture Ring on the lens all the way open and turn on Live View on your camera (if you have it). If not, look through the viewfinder. Compose and focus your shot. – Remember, the lens focus ring will have minimal impact. Focus by changing the distance between subject and camera. Sometimes, placing your subject or camera on a piece of cardboard will allow you to ever-so-slightly slide them to get maximal focus. Stop down the lens – As with standard camera technique, smaller apertures will give you greater depth of field. Often, you will struggle to get as much depth of field as you'd like as in macro photography it is so tiny anyway. Realize that when you do stop down the lens, (you're using the ring on the lens barrel, right? ), things will get darker through the viewfinder. Be prepared to refocus as it's hard to move the aperture ring and not move things slightly. If you decide you like what you get with this macro technique, but want to take your control up a few notches, it might be time to buy a Focus Rail. 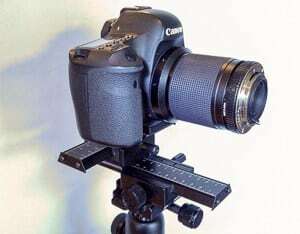 These devices allow you to mount your camera and then, through a system of fine gears and adjustment knobs, move your camera in tiny increments. When you are working for ultimate focus and the tiniest movement of the camera makes a difference to what is and isn't in focus, these can be extremely helpful. You can spend big money on highly sophisticated rails, some even computer-controlled and motorized, but when starting out, something like this simple unit from Neewer is what I use and is very reasonable. If you simply can't get the depth of field you need, Focus Stacking may be the solution. The technique involves taking multiple shots, each focused just slightly to a different point, and then combining them in editing to obtain depth-of-field that could not be obtained in a single shot. 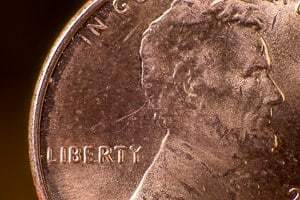 Photoshop can do this and if you are new to macro probably is a good place to start. If you later require more sophistication, programs like Helicon Focus or Zerene Stacker may be worth a look. Battery-powered LED lights can be had inexpensively from the hardware store and are great for macro lighting. Small battery-powered lights that can be brought in close can be useful. I find the inexpensive LED lights available at most hardware stores can work well. Also remember that if your exposure is multiple seconds you may be able to “light paint” your subject for more even lighting. If you want to be a little more portable, a Ring Light is what many macro photographers use. Mounted to the front of your lens, they put nice even light right on your subject. 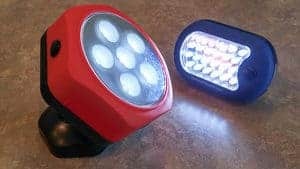 When shopping for them, be sure you are getting what you intend as some are continuous light LED lighting and some, (usually more expensive), are strobe-type flash units. 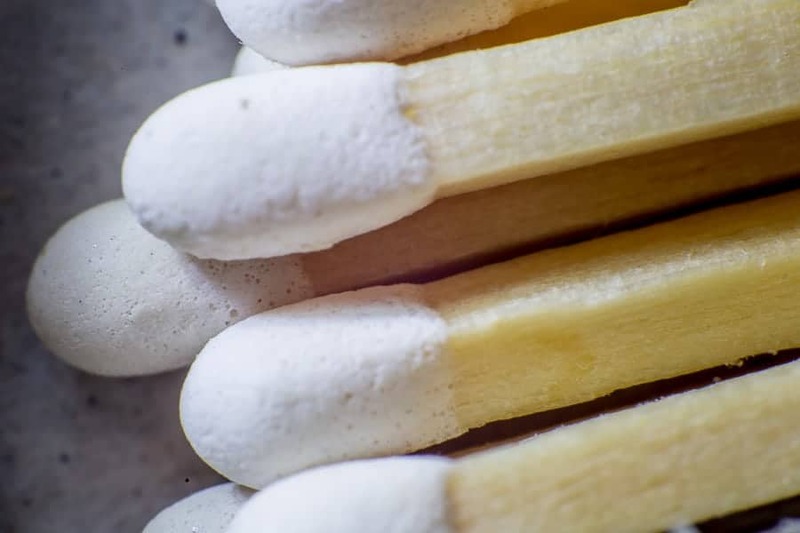 If you are thinking of these however, you may be ready to move beyond the reverse-lens technique to a true macro lens. 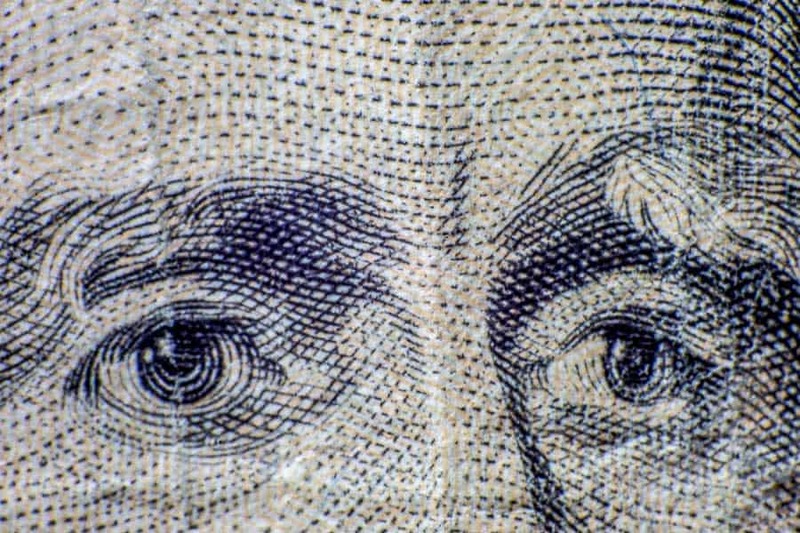 To me, the real plus of the Reverse-Lens technique as an introduction to macro photography is it is very inexpensive. 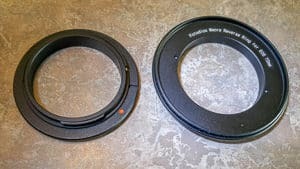 If you already have an old film camera lens or two, Macro-Reversal Rings like these from Fotodiox can let you give macro a try for less than $10.00. (Be sure you get the right filter thread size and mount type for your lens / camera!) If you have to pick up a film camera lens, try a pawn shop, garage sales, Craigslist, Ebay, or such places. You should be able to find something that will work for under $20.00. Reversed Vivitar 28-105mm at 28mm. Another option and one that will let you use your existing DSLR lenses while also maintaining full lens and aperture control on various Canon cameras is this Neewer adapter which maintains all electrical connections while your lens is reversed. There are a few other manufacturers making similar devices. I can't personally vouch for these never having used one, but they look intriguing. I mentioned extension tubes and bellows in the beginning of the article. Some extension tubes maintain communications between camera and lens, the cheaper ones don't. I've had good reports on these Kenko extension tubes. These a bit more expensive, but of the variety that provide full lens-camera communication. A bellows is like having a variable extension tube. There are many kinds and like the extension tubes, whether they communicate with the lens for aperture and focus control greatly affects the price. However you choose to go, Macro is a whole new area of photography to explore. 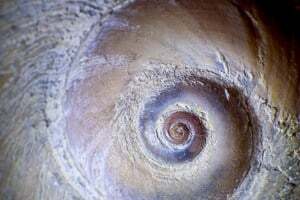 Give one of these techniques a try and discover the wonder and beauty of this tiny world.